Well, I give up. 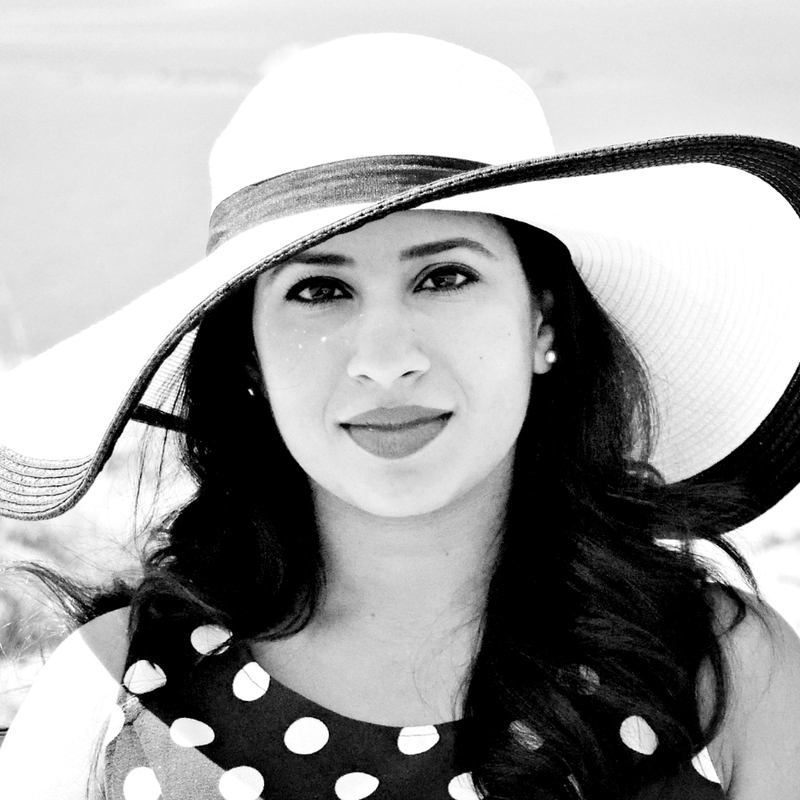 I'm vying to post more beauty posts this year, but my stomach just takes more priority. 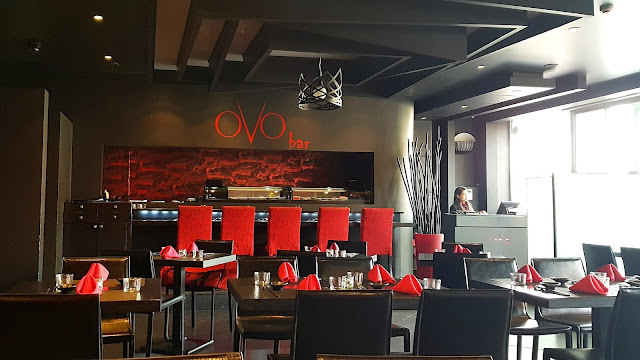 Here's another restaurant review for all my foodie followers, OVO Bar, a very trendy Asian fusion restaurant nestled within the depths of Salmiya. I just found out that OVO is an acronym for "Our Very Own Bar", which I think is so cute and personalizes the name. Gorgeous interiors, I love the red and black theme. The seats at the bar are also a great idea, though we chose a more kid friendly table in the corner. Once we were settled down, our waitress handed us our menus and also an iPad with photos of each dish. The menu was quite extensive and it took us a good 15 to 20 minutes to go through the entire book. I counted 38 different types of Maki. That's a lot! Most of the dishes had photos in the menu and it was easy enough to find photos of the missing dishes on the iPad - you know how I love my food photos. ♫♬"If you like Pina Coladas..."♪♫ then you have to order the Pink Pina Colada. Coconut cream, pineapple juice and strawberries - whats not to love!? 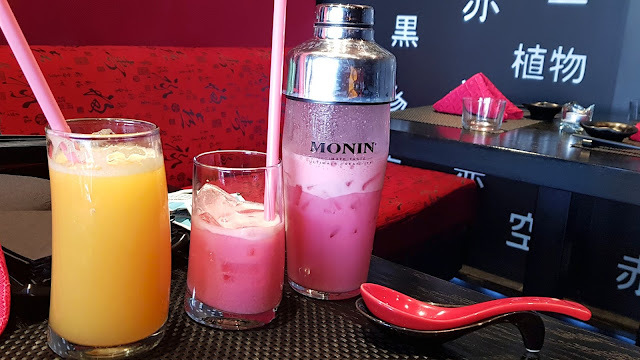 It was smooth, creamy, fruity and delicious; a definite must-order. We also ordered a glass of freshly squeezed orange juice, pretty standard. We first ordered the Tom Yum Soup and I've got to tell you, it was hands down the best Tom Yum I've had in Kuwait. Portion size is a little on the smaller size than what I'm used to, but it was fantastic. The soup contained shrimp, squid and mushrooms with each ingredient cooked through perfectly. I got heat and sourness with every mouthful, a beautifully balanced soup! We also ordered the Shrimp Lollipop which is basically fried shrimp in a chirri sauce. Because of the colour, I was expecting it to be fiery hot, but it wasn't at all and the kids loved it. 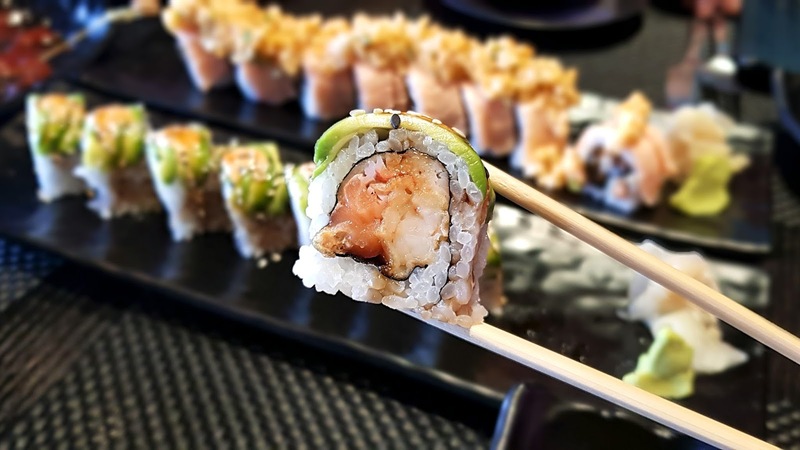 We also tried two different maki (What's the plural of maki? Makis?). 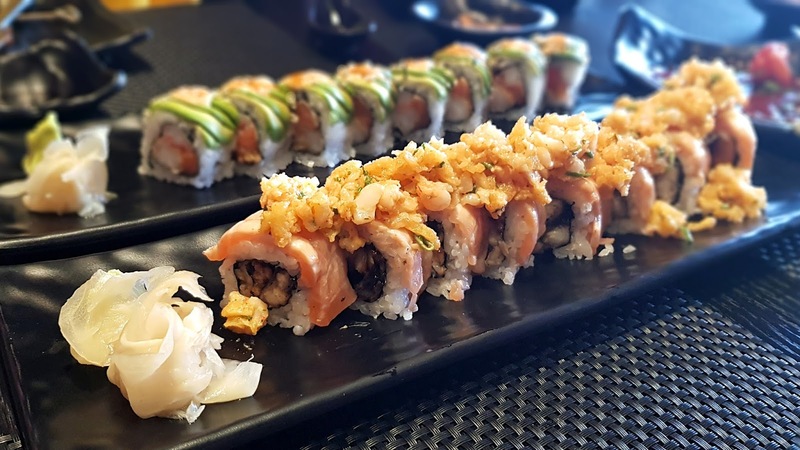 The Monskie Maki (above) was recommended to us by our waiter and it contained salmon, ebi tempura, crab and ginger and we also chose the Dragon Maki (below) which contained salmon, boiled shrimp, ebi tempura, unagi and spicy mayo. I chose this mainly because of Ross' Unagi reference. If you get this, we can be friends! I didn't really taste the tempura elements in both maki, but they were still delicious. I mean, you can't really go wrong with maki right? 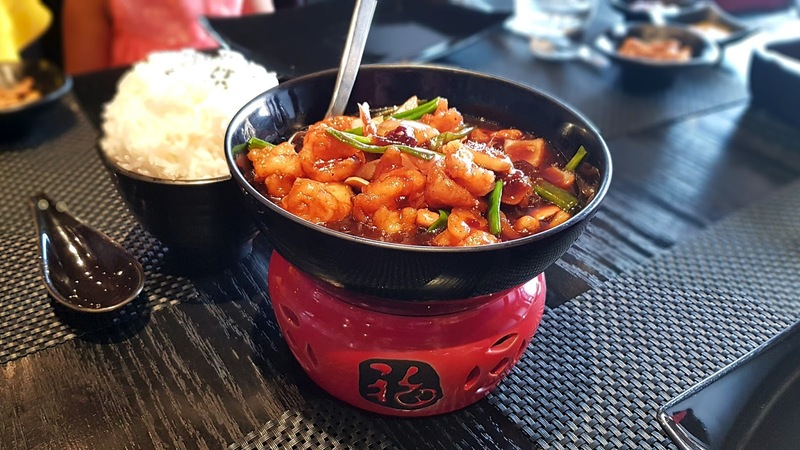 Finally for our main (we were already quite stuffed by this point), we chose the Kung Pao Prawns with a side of steamed white rice. 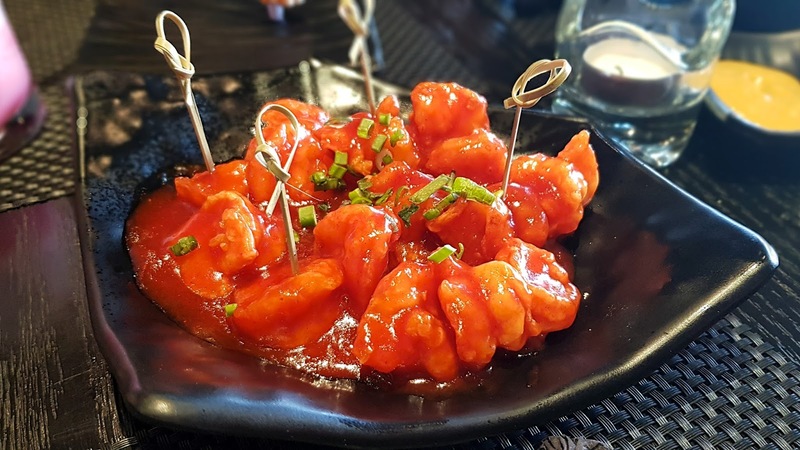 The prawns dish contained ginger, dried chili and a generous sprinkling of cashew nuts in a plum based sauce. The flavour of ginger was quite dominant, but really complemented the sweetness lent to the dish by the plum sauce. A great dish! The OVO Bar is a great place to bring a date to. In fact we only spotted couples during our lunch. They're located at the Byblos Complex in Salmiya, just off of Baghdad Street (see map below). 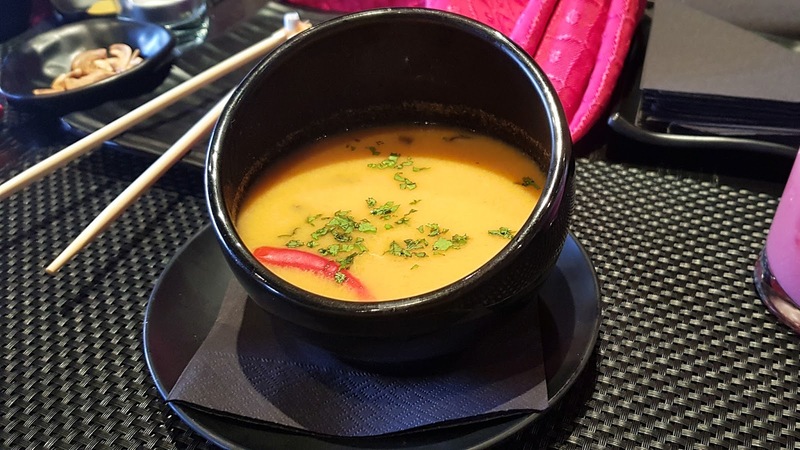 A big thanks to OVO bar for the lovely meal, we would love to visit again to try more dishes! Follow them on Instagram @ovobar for more mouth-watering photos! Yummers!! :) Haven't checked out this place. Hopefully soon. Oooh yes, you'll love it! The soup especially!